It is difficult to separate Sherban Cantacuzino’s professional and private biography from his lifelong dedicated work in service of architecture and heritage conservation in Europe and the world. 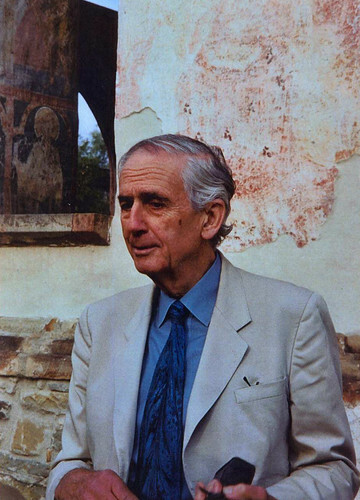 His teaching activities (history of architecture), the numerous lectures he gave throughout the world, his scholarly articles and books that contributed substantially to a new philosophy of modern conservation, his vision of Europe’s common heritage in its diversity, helped shaping national and European policies and programmes in the field of architectural and natural heritage protection. Sherban Cantacuzino held high functions with, in chronological order, the Architectural Review, the Royal Fine Arts Commission, ICOMOS and ICOMOS UK and was a member of prestigious award juries and panels, rapporteur and rapporteur general of UNESCO and ICOMOS conferences. After the fall of communism, he concentrated much of his energies and efforts to saving Central and Eastern European countries’ heritage, by offering his advice and competences in improving legislation, changing policies, by organising campaigns, study tours, training seminars for young architects. He initiated numerous projects in these countries, particularly in Croatia and Romania, his country of origin. One of them aimed at restoring a group of wooden churches in Northern Romania (Maramures), had as a result that a number of 8 selected churches in the area were accepted in 1998 on the UNESCO World Heritage List. He is the Founder and President of the Pro Patrimonio Foundation, The National Trust of Romania.